As urban folk are further isolated from the countryside where the majority of the food is produced, the stereotype about Old-MacDonald type small family farms lives on. Who doesn't get warm fuzzies when contemplating a red barn full of hay with a rope swing in the loft, and happy cows contentedly chewing cud? McDonalds is all over that. Localism, nostalgia, patriotism - this burger has it all. ...and eggs on a crate. Maaskant said producers should be willing if people want to visit farms to see the source of their food. Animal agriculture practices have changed for the better over time and producers should be ready to explain it. “I think it’s something we can be proud of and something we can talk about. I’m not ashamed to show anybody what I do,” he said. John Maaskant is a chicken farmer. Or an egg farmer? 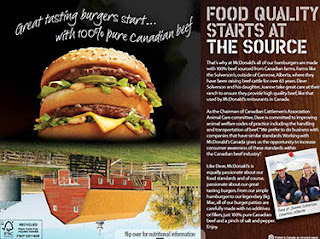 I wonder what a picture of his hens would look like on a billboard, and why the Farm Animal Council of Saskatchewan chose to have the only billboard in the series without a picture of the animal that provides the food. These billboards are meant, according to the site, to be one of a "series of programs and activities, all designed to advance responsible animal welfare." Surely, then, the group can combat the wild claims about battery cages? Not showing the truth is not a savvy move.